The impact of a work of art is often revealed in subtleties. For collectors Josh Rogers and Lesley Weisenbacher, the experience of art—and where its power lies—is both tactile and elusive. In this context, art making itself becomes an act of ritual; or as Gerhard Richter, whose thickly textured paintings draw the viewer into unexpected depths, once described it—the pure realization of religious feeling. The Chicago-based couple is continually in search of these exalted forms, powered by a kind of beauty that overwhelms and mystifies. Their shared passion has resulted in a collection of over 150 works of art that inspire contemplation. Rachel Niffenegger, Shroud (Striated Spill). 2015. Power Objects: The Future Has a Primitive Heart, which runs through May 15 at the Urban Institute for Contemporary Arts (UICA), invites viewers to explore such connections between the material and ethereal. Thirty select works from the Rogers / Weisenbacher collection, including pieces by Rachel Niffenegger, Elijah Burgher, Mariano Chavez and others, are on view. To hear Weisenbacher speak of Niffenegger’s Shroud (Striated Spill) (2011)—a piece she continually finds herself re-confronting and re-thinking—one gets a sense of its existential allure. Suspended tenuously and with bits of plaster falling off as time passes, it speaks to the inevitability of death and decay. And yet its power is very much alive, “almost jump[ing] off the wall, “forc[ing] the viewer to stop and deal with it,” as Weisenbacher describes it. A contemporary version of a memento mori, the piece connects the viewer with a longstanding tradition of artists, poets, and philosophers. 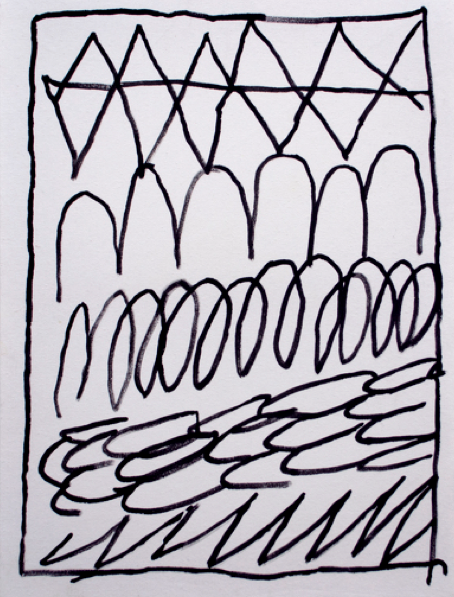 Ron Ewert, Thumbnail #6 (2012). 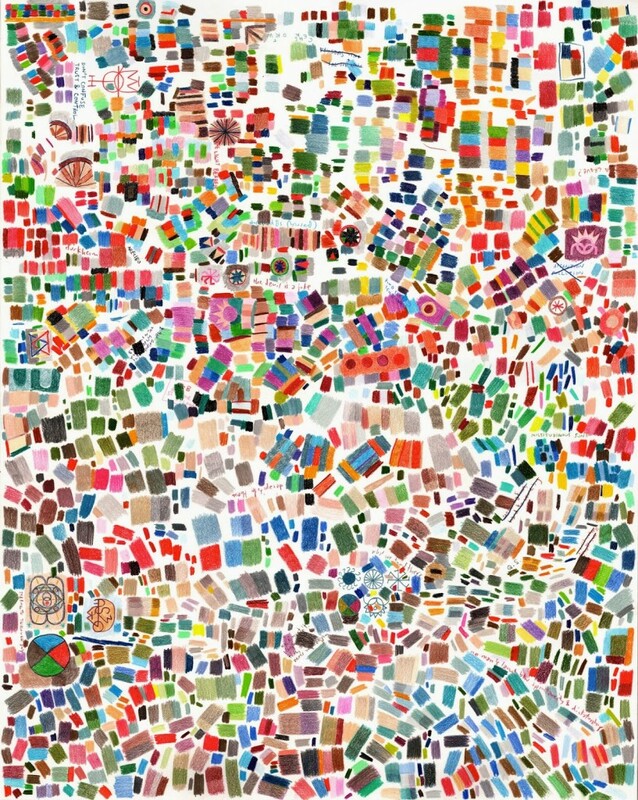 Interacting with the other pieces in the collection requires a more conceptual, abstracted approach—like the cryptically simplistic Thumbnail #6 (2012), by Ron Ewert, a white background interrupted by cartoonish squiggles, and Elijah Burgher’s intricate, multi-colored Don’t confuse trust and control (2013), which leads the eyes towards all corners of the piece in maze-like fashion. The power in these works appears to lie in what is unseen, in what we can’t quite grasp or know. This search is akin to the way Rogers describes the act of collecting itself—as a continual learning process. For him, the search began with a college art history class, which in turn ushered in a newfound obsession with looking at and reading about art. While living in New York City in 1998, Rogers became friends with artist Michael Shaw and started to immerse himself more fully in the art scene by attending gallery openings, continuing to meet artists—and buying art. Elijah Burgher, Don’t confuse trust and control. Supporting their local art scene, and in particular emerging artists, has been a significant focus for the couple since they began collecting together in 2009. Averse to the act of collecting as luxury consumption, Rogers and Weisenbacher find it essential to get to know and form dialogues with the artists they support, as well as other “passionate and thoughtful people in the art ecosystem” such as gallery owners and those involved in nonprofit art spaces. Power Objects: The Future Has a Primitive Heart, runs through May 15 at the Urban Institute for Contemporary Arts (UICA). Alexandra Kadlec is a writer and editor whose work has appeared in Time Out New York, Chicago Art Magazine, Chicago DIY Film Magazine, and Revue Magazine. She currently works in corporate art management for Reagan Marketing + Design. 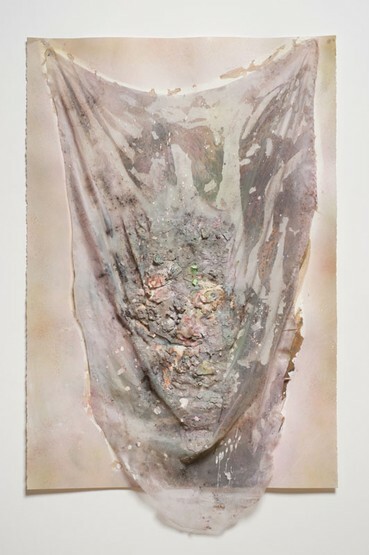 March 23, 2015 | Filed under Art Seen: National and tagged with Alexandra Kadlec, Elijah Burgher, Josh Rogers and Lesley Weisenbacher, Mariano Chavez, Power Objects: The Future Has a Primitive Heart, Rachel Niffenegger, UICA.